O God, who made the Bishop Saint Cyril of Alexandria an invincible champion of the divine motherhood of the most Blessed Virgin Mary, grant, we pray, that we, who believe she is truly the Mother of God, may be saved through the Incarnation of Christ your Son. Who lives and reigns with you in the unity of the Holy Spirit, one God, for ever and ever. Amen. Grant, O Lord, that we may always revere and love your holy name, for you never deprive of your guidance those you set firm on the foundation of your love. Through our Lord Jesus Christ, your Son, who lives and reigns with you in the unity of the Holy Spirit, one God, for ever and ever. St. Cyril, Patriarch of Alexandria, one of the metropolitan sees of the Christian Church in the east, was one of the great defenders of the faith against the heresy of Nestorius who denied the oneness of person in Jesus Christ. At the Council of Ephesus in 431, over which he presided in the pope's name, and at his instigation, it was defined that Christ, the Son of God, is at the same time God and man, and the Blessed Virgin Mary, His mother, is truly Theotokos, the Mother of God. 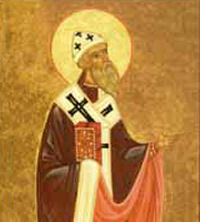 St. Cyril died in 444. The Church venerates him as one of her great doctors. His commentary on the Gospel of St. John is one of the richest doctrinally of those left us by the Fathers of the Church. The feast of St. Cyril of Alexandria in the 1962 Missal of St. John XXIII of the Extraordinary Form of the Roman Rite is celebrated on February 9. St. Cyril is one of the great Greek Fathers of the Church. He was chosen by Divine Providence to be the shield and champion of the Church against Nestorius, who denied the unity of persons in Christ. If this heresy had succeeded, Mary would not be called the Mother of God. Excepting Sts. Athanasius and Augustine, his equal as a defender of orthodoxy can hardly be found in the Church's history. His greatest achievement was the successful direction of the ecumenical council at Ephesus (431), of which he was the soul (Pope Celestine had appointed him papal legate). In this council two important dogmas were defined—that there is but one person in Christ, and that Mary (in the literal sense of the word) can be called the Mother of God (Theotokos). His successful defense of the latter doctrine is his greatest title to honor. His writings show such depth and clarity that the Greeks called him the "seal of the fathers." He died in 444 A.D., after having been bishop for thirty-two years. In Rome, the basilica of St. Mary Major stands as a most venerable monument to the honor paid Mary at the Council of Ephesus. On the arch leading into the sanctuary important incidents in the lives of Jesus and Mary are depicted in mosaic. In 1881, he was declared a Doctor of the Church by Pope Leo XIII, and in 1944, on the fifteenth centenary of Cyril's death, Pope Pius XII issued his encyclical Orientalis Ecclesiae, commemorating Cyril's place in the history of the Church. Symbols: Shown holding a pen; with the Blessed Virgin Mary holding the Child Jesus. Read Pope Pius XII encyclical, Orientalis Ecclesiae (On St. Cyril, Patriarch Of Alexandria). Read some excerpts from the writings of St. Cyril at the Crossroads Initiative. St. Cyril lived in the fifth century and combated the heresy of Nestorius, who denied the union between the humanity and divinity of Our Lord Jesus Christ, and thus, the divine motherhood of the Blessed Virgin Mary. (See Catechism of the Catholic Church 466) Read what the Catholic Encyclopedia says about Nestorius and Nestorianism. 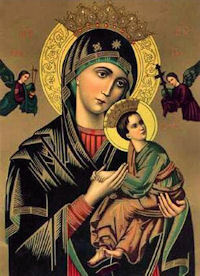 Also known as Our Lady of Perpetual Succour, is celebrated on June 27 by the universal Church. The devotion to this Marian advocation revolves around the picture of Our Lady of Perpetual Succour, painted on wood, with background of gold. It is Byzantine in style and is supposed to have been painted in the thirteenth century. It represents the Mother of God holding the Divine Child while the Archangels Michael and Gabriel presenting Him the instruments of His Passion. Over the figures in the picture are some Greek letters which form the abbreviated words Mother of God, Jesus Christ, Archangel Michael, and Archangel Gabriel respectively. The icon was brought to Rome towards the end of the fifteenth century by a pious merchant, who, dying there, ordered by his will that the picture should be exposed in a church for public veneration. It was exposed in the church of San Matteo in the famous Roman street of Via Merulana, which connects the basilicas of Saint Mary Major and Saint John Lateran. Crowds flocked to this church, and for nearly three hundred years many graces were obtained through the intercession of the Blessed Virgin. The picture was then popularly called the Madonna di San Matteo. The church was served for a time by the Hermits of Saint Augustine. These Augustinians were still in charge when the French invaded Rome (1812) and destroyed the church. The picture disappeared; it remained hidden and neglected for over forty years, but a series of providential circumstances between 1863 and 1865 led to its rediscovery in an oratory of the Augustinian Fathers at Santa Maria in Posterula. Pope Pius IX, who as a boy had prayed before the picture in San Matteo, became interested in the discovery. But at that time, the ruins of San Matteo were in the grounds of a convent of the Redemptorists -- the Congregation of the Most Holy Redeemer -- founded by St. Alphonsus Liguori (1696-1787). The Father General of the Redemptorists, Most Rev. Nicholas Mauron, decided to bring the whole matter to the attention of the Pope. The Pope listened attentively and felt sure it was God’s will that the icon should be gain exposed to public veneration and the logical site was their church of St. Alphonsus, standing as it did between the Basilicas of St. Mary Major and St. John Lateran. The Holy Father at once took a piece of paper and wrote a short memorandum ordering the Augustinian Fathers of St. Mary in Posterula to surrender the picture to the Redemptorists, on condition that the Redemptorists supply the Augustinians with another picture of Our Lady or a good copy of the icon of Perpetual Help. The Icon meant much to the Augustinians, but when the two Redemptorists came armed with the Pope’s signed memorandum, what could they do but obey? On January 19, 1866, Fathers Marchi and Bresciani brought the miraculous picture to St. Alphonsus’ church. Preparations were now made to inaugurate the new public reign of Our Lady of Perpetual Help. On April 26th, a great procession was staged in which the picture was carried throughout the Esquiline region of Rome. Upon returning to the church, the picture was enthroned over the high altar, in a resplendent shrine-niche especially constructed for it. The report of marvelous healings spread rapidly throughout the city of Rome and people came by the hundreds to visit the shrine. Soon the whole area around the altar was filled with abandoned crutches and canes and several whole glass-covered cabinets were filled with gold and silver thanksgiving offerings in the shapes of miniature hearts, arms, legs and other votive offerings. Scarcely two weeks after the solemn exposition of the picture, Pope Pius IX himself came to visit the shrine. He stood quietly before it for a long time and then exclaimed: “How beautiful she is!”. Pope Benedict XV had the picture of Our Lady of Perpetual Help placed immediately over his chair of state in the throne room. Here it could be seen by all just over his head, as if to say: “Here is your true Queen!”. Pope Pius IX told the Redemptorists, in speaking to them of the treasure he had committed to their care: “Make her known!” It seems as though they hardly needed the exhortation. In the United States, they built the first Our Lady of Perpetual Help church in the Roxbury section of Boston, and it was eventually raised to the honor of a “Papal Basilica” by Pope Pius XII. The influence of Eastern icons in the West, around the XII and XIII centuries brought a class of icons called Cardiotissa, from the Greek word kardia, meaning heart. Cardiotissa means “having a heart” or showing sympathy and mercy and compassion. In them the face of Our Lady appears full of sorrow, yet supremely dignified in her contemplation of the sufferings of her Son. His passion is represented by angels holding instruments of His passion, most often the cross, the lance, the sponge, and the nails. The Our Mother of Perpetual Help icon is of this type. The angels holding the instruments of the Passion have their hands covered with a protecting veil as a sign of reverence in handling sacred objects. The Child Jesus is shown with an adult face and a high brow, indicating His divine Mind of infinite intelligence. As God, He knew that the angelic apparition was prophetic of His future passion. Yet in His human nature as a small child, He is frightened and runs to His Mother for protection. Our Lady hastily picks Him up and clasps Him to her bosom. This action is indicated by the fact that the Lord’s right foot is nervously curled about the left ankle and in such haste that His right sandal has become loosened and hangs by a single strap. Further action is indicated by the way the Child Jesus clasps His Mother’s right hand with both of His, holding tightly to Our Lady’s thumb. Our Lady is clothed in a dress of dark red which was long preserved in the Byzantine world for the Empress alone, indicating the Queenship of Mary. Some commentators on color claim that bluish purple became the color of penance in the Western Church (during Lent and Advent) because purple is a combination of blue and red. The blue reminds us of heaven, to which we wish to arrive by our penance, and the red recalls martyrdom, because all penance requires a dying to oneself, especially mortifying inordinate desire for food and pleasure. The archangels Gabriel and Michael were tunics of purple since they carry the instruments of the passion and death of Christ. The figures of the icon are identified with abbreviations of their names and Mary is designated by her chief title to glory: Mother of God. Our Lady’s face is of unspeakable majesty and calm and yet her large eyes, partly closed, express ineffable sorrow and sympathy. Our Lady is not looking at Jesus, but rather to us, to express compassion for us in our fears and sorrows. Read the History of the Icon. Visit Our Lady of Perpetual Help Radio site to see an explanation of the symbols of the Icon. See also Women for Faith & Family page on Our Lady of Perpetual Help.